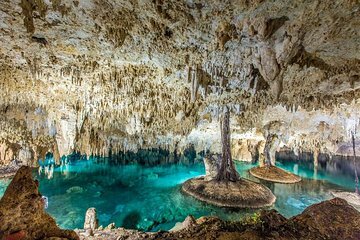 Descubra paisagens naturais espetaculares, juntamente com um dos mais renomados sítios arqueológicos do México, durante esta excursão repleta de ação e serviço duplo. Aproveite o tempo livre para explorar Tulum, uma cidade portuária antiga e fotogênica com vista para o Mar do Caribe. A maioria das excursões termina por aí, mas você mudará as marchas das atrações culturais para as naturais com uma visita ao maior conjunto de cavernas submarinas do mundo. Nade por um mundo oculto de estalactites suspensas, anteriormente não descobertas. This private tour was very special and well worth the money! Our tour guide, Tony, was knowledgeable, entertaining and engaging. We were very comfortable on the van and appreciated our private AC controls and the provided water. Tulum was a Mecca of interesting history and beauty. Hearing the complete story and learning how these people lived was awesome. All of this situated on the beautiful coast, made it even better. The views were spectacular. The tour through the caves of the River Sac Actun, was the highlight. We were a bit concerned about the water temperature in November, so 3 of the 5 in our group elected for the 10 wet suits. The 2 without wetsuits were very comfortable and said the lifevests kept them plenty warm. A different guide took us through the caves. We floated, dog paddled and swam. The guide was hilarious and kept the water beautifully lit with a small flashlights. There were installed lighting in a couple of places. We were offered to go in a deeper part of the caves not normally accessed and took him up on the offer. We all got in a small part of a cave, the guide turned out his light to show us how dark it was. Then he was gone! Joke was on us. After what seemed like an eternity, and someone in the group threatened no tip, he turned on his flashlight around the corner. Back to the condo, about a 45 minute drive. We recommend this tour. Great for all ages!